Twenty One Clairtrell‘s [map] penthouse suites were launched this week at an elegant champagne reception complete with chamber music held at their sales centre. Developers, The Rockport Group, have made these unique one of a kind penthouse suites –sending potential buyers hustling to land their digs before anyone else does. And I can see why…. Here’s just one of the ‘Champagne Collection’ designs, Penthouse N. This was definitely my favourite layout, but be sure to look at the other ten that are available (probably not for long). 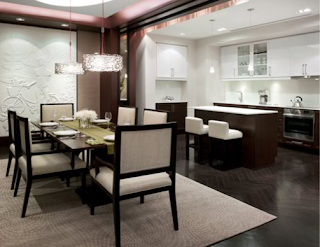 The details: the N suite is a 2 bedroom plus den penthouse suite, with 1,463 sq. ft. interior, a 151 sq. ft. balcony and an enviable second floor private rooftop terrace, at 1,410 sq. ft. The suite’s floor plan allows for an open space concept, with its living room, dining room/ kitchen opening onto the balcony with a door in either room. With its southwest positioning, I can only dream about how fab the evening sunsets will be. But there’s a good chance that I will be taking in the views from my private rooftop terrace, hosting dinner soirées in the summer and curling up by the fireplace in the fall. Avid gardeners, delight in the exotic flower possibilities! The master bedroom has a spa-inspired en suite, a walk-in closet and a huge bathroom with two sinks and a soaker-tub. Penthouse N is a total of 3,024 sq. ft. 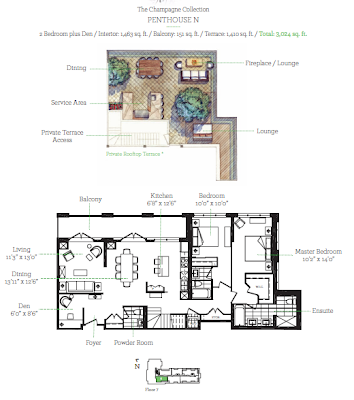 The other ten penthouse layouts range from 1,223 to 3,108 sq. ft; suites in Twenty One Clairtrell range in price from $300,000 to $1.2 million. Twenty One Clairtrell is located in Willowdale, Toronto and interested buyers should register on their website here or hustle down to the presentation centre, 386 Sheppard Avenue East, Monday to Wednesday: 12 – 6 pm; Saturday, Sunday and Holidays: 12 – 5 pm.